I received this book from Netgalley in exchange of an honest review. 3.5 stars. Well, I kind of expected better from this. But right from the start I have to reduce 1 star. Why? Most of the border around the images are High-res, but then the comics are so Low-res that it actually hurt my eyes. 😐 I know the comics are old, but come on, try to make it all High-res. Not blurry, hard to read stuff (some text bubbles were impossible to read), which ruins the comics. Also can we please have the comics in one place. Not Left > Right > Left > Middle > Left. Or with, or without backgrounds. Pick one, not more. I can imagine it might work on paper, but sorry, it looks highly unprofessional on ereaders/tablets/phones. 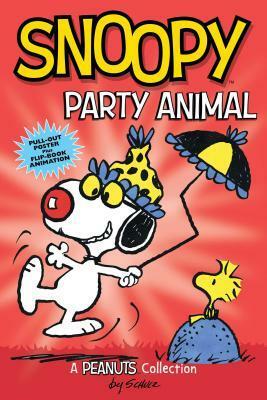 This book is (as the title suggest) about Snoopy. Though there are also quite a lot of comics not about him, which was a delight. Don’t get me wrong, Snoopy is great, but I love seeing the other characters as well. I really like Snoopy, he was one of my favourite characters (though no one can top Linus). It was really fun to see old comics getting collected and centre around one character, hopefully there is already, or there will be one, about Linus. I would get that in a heartbeat, well, if the graphics are good. Otherwise, no thank you. There are several themes which run through the book, Snoopy trying to snipe people from his house, or tree, but failing each and every time. 🙂 Or about his food times (which he seems to not be able to remember). There was just one character that I don’t like, and never liked, and that was Frieda. Obnoxious, annoying, frustrating. I also liked the extras at the end, they really were fun, and it was nice they were added. Maybe they could have used a more Peanuts kind of theme though (as that is what the book is about). Would I recommend this one? If the resolution of the comics is better, yes. Otherwise, don’t ruin your eyeballs.